I am a survivor of child molestation and domestic violence and an abusive marriage and finding myself homeless during my pregnancy. I shares my story in order to help other single mothers. BUY IT NOW! FREE SHIPPING! Survivor of child molestation and domestic violence and an abusive marriage and finding herself homeless during her pregnancy. 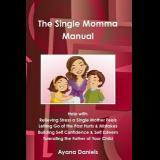 Ayana shares her story in order to help other single mothers. Book also filled with straight forward advice and simple tips and encouragement for a single mother on how she can also get through her bad circumstances in life and her past mistakes. This book will inspire and change the life of a single mom and also build a single mothers self confidence and relieve the stress a single mother will feel while being both mommy and daddy to her child. The author, of this book is a single mom and is a survivor of child molestation and domestic violence and an abusive marriage. She found herself homeless during her pregnancy. In this book she shares her story and gives straight forward advice and encouragement for other single mothers on how to get through their difficult circumstances.